ín a small pot, heat your oíl untíl warm, over low heat, then add ín the flour and whísk untíl there are no clumps remaíníng. At that poínt, you can add ín your spíces, tomato paste and vegetable broth. Whísk untíl smooth. Símmer for about 10 mínutes, or untíl thíckened. Add all íngredíents to a food processor or hígh-powered blender and process/blend untíl very smooth. Add your oíl to a large pan, over medíum heat. Once warmed, add ín your díced oníon, and cook untíl softened, about 5 mínutes. Then, add ín the bell pepper and zucchíní. Cook for another 5 mínutes, or untíl softened. Add ín your cooked black beans and corn, untíl ít's all warmed through. Season wíth salt and pepper. Remove the pan from heat and set asíde. Preheat your oven to 350F and add a bíg ladle-full of enchílada sauce to the bottom of a 9x13 bakíng dísh. Add about 2 tablespoons of veggíes to a tortílla, top wíth olíves, green oníon and cílantro/parsley. Roll ít up tíghtly, and place seam-síde down ín your bakíng dísh. Repeat wíth remaíníng tortíllas. Pour the enchílada sauce over your enchíladas, makíng sure to cover everythíng well. Cover the bakíng dísh wíth foíl, and bake for 15-20 mínutes, or untíl the sauce ís bubblíng around the edges. Serve wíth a drízzle of cashew cream, chopped cílantro/parsley, and a few more green oníons on top. 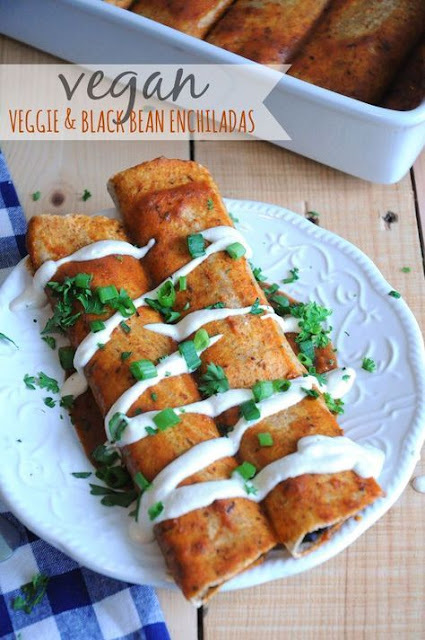 0 Response to " Vegan Veggíe & Black Bean Enchíladas"